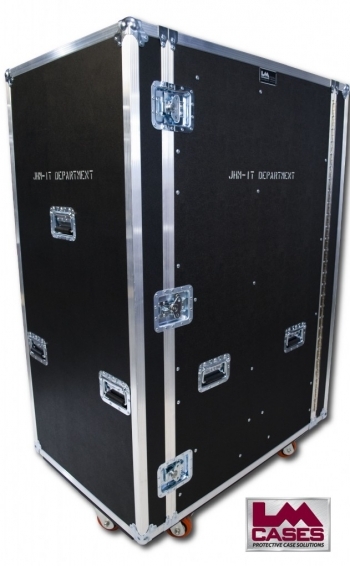 This case was built for John Hagee Ministries - IT Department. 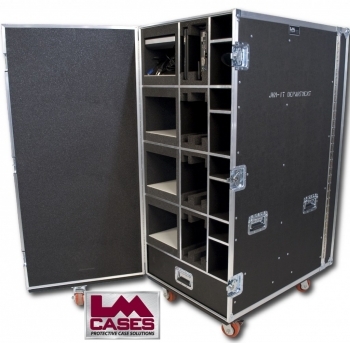 The case is a double hinged work station (T-Style lid closure), allowing storage for four sets of point of sale stations and 1 drawer per side of the case for a total of 8 groups of workstations & 2 drawers per case. 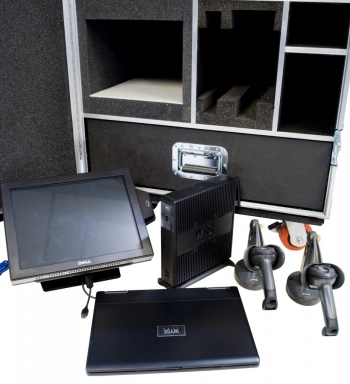 Each group of items includes a Dell point of sale computer, a WYSE Thin Client PC, a WYSE Mobile Thin Client laptop and two bar code scanners (group shot pictured below). The Dell point of sale computer is housed in a 2" foam lined compartment with a white HDPE floor to allow for maximum protection as well as easy in/out. The computer is designed to ride with the screen facing upward to ensure the screen can not be scratched or damaged during transport. 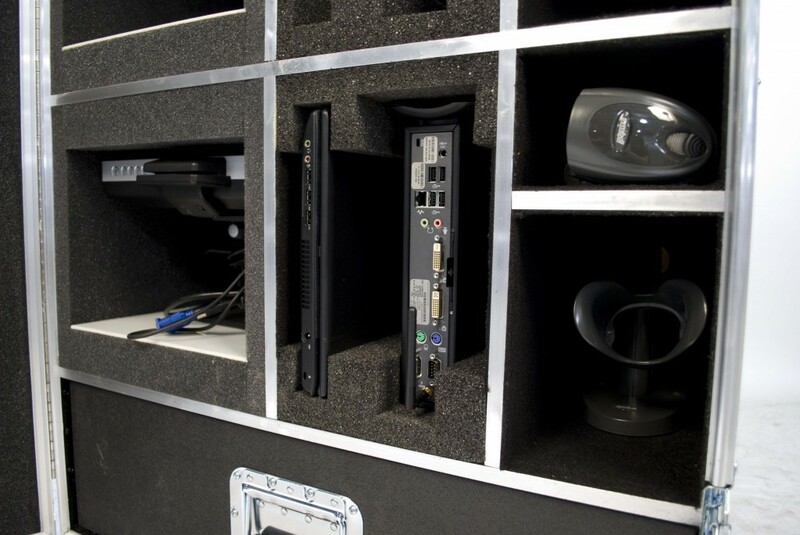 The WYSE Thin Client CPU and laptops ride in a custom foam lined compartment allowing them to be slid in on their sides. 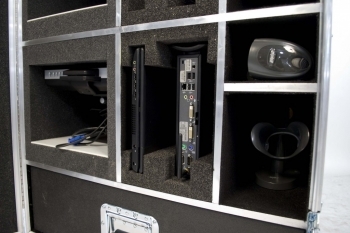 The custom foam inserts for the Thin Clients were cut on our Wintech Fast Wire CNC saw, which allowed for the long neat cuts needed to create the compartments. The 2 bar code scanners and desktop holders are stored in the two carpet lined compartments to the right of the Thin Client computers. The case is built out of 1/2" plywood laminated with black ABS plastic, deep recessed handles, pad-lockable hasp latches & 4" x 2" HD locking casters. Special thanks to John Hagee Ministries!